The team here at FaveCrafts Worldwide Headquarters was sent on a mission this week to create the ultimate holiday tree. The fine people at Michaels have invited us to participate in this year’s Dream Tree Challenge and we are up for it. We thought that it would make sense to make a tree in our favorite FaveCrafts colors, so that was our inspiration. We scoured the Michaels store for everything in our signature colors and boy did they have a selection. Next up is the DIY part of this challenge, we are making all our own ornaments. Since we thought the FaveCrafts colors were so appealing for the holidays, we pulled together a collection of holiday ideas in these fun colors you may enjoy. Christmas may seem far away, but in reality, there’s only a little over two months left. Next thing you know, it’s December and school’s out for winter break. The editors at AllFreeChristmasCrafts know this can be a bit exhausting, so we wanted to help you find new ways to keep your family entertained all throughout their time off. The good news is we have a new free eBook, 7 Easy Homemade Christmas Ornaments for Kids, and it has full tutorials and color pictures that are a great start for young crafters. We made this eBook for parents and kids looking for new ways to enjoy themselves during the holidays. More people are trying to find ways to lower the amount of money they spend on Christmas, and one simple way to do this is by making brand new decorations with what’s already in your home. Within the pages of our new eBook, you’ll find 7 totally different ways to decorate your tree this year that children of all ages will be able to do without trouble. Make this Christmas memorable by spending an afternoon with the family- it’s a great way to introduce the little ones to arts and crafts, and you’ll all have tons of fun working on these original homemade Christmas decorations. Salt Dough Gift Ornaments and Tags – You’ll never run out of options with this salt dough recipe that can be molded into practically anything. Children will love how versatile it is, and they can use their favorite Christmas cutouts to make cute little ornaments that they can personalize in any way they choose. You can write their names and the dates on the finished products to commemorate the day you spent making these nifty little ornaments. You can even use these as decorations for Christmas gifts; it’ll show your little Christmas helpers how proud they should be of their handmade ornament crafts. Snowy Owl Ornaments – Owls are getting more and more popular by the minute, so this is the perfect easy Christmas craft for this year. The best part is that you probably have several (or all) of the supplies needed for this project in your craft drawer already. 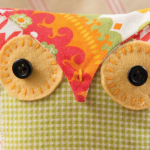 Be sure to stock up on embellishments so your little ones will be able to make their owl as individual as they are. The soft, easy to handle fabric and fun little details will keep crafters of all ages entertained. Download a copy of 7 Easy Homemade Christmas Ornaments for Kids – It’s free! 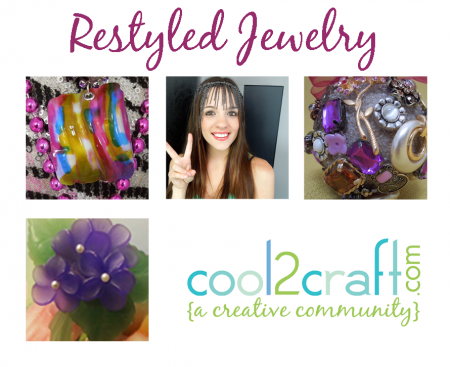 Restyled Jewelry Ornaments, Fun and Funky Pendants and more on Cool2Craft TV! This week, the Cool2Craft design team is digging into their jewelry boxes to restyle jewelry! 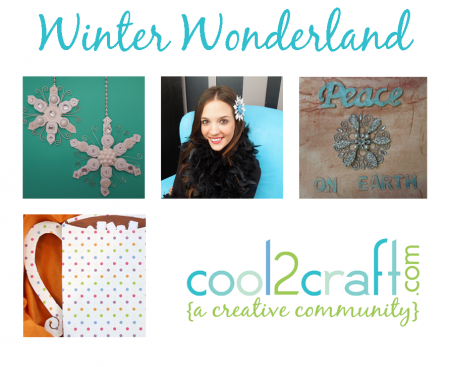 Watch your favorite crafters create super cool projects and join in the on-line live chat. Join EcoHeidi Borchers, Tiffany Windsor, Candace Jedrowicz, and Savannah Starr for this week’s online episode. EcoHeidi is crafting Fun and Funky Cool2Cast Water Bottle Pendants, Tiffany Windsor is creating Restyled Jewelry Ornaments, Candace is sharing an easy technique for transforming a Pin to Pendant and Savannah Starr is upcycling a Chain Necklace into a Headpiece. It’s easy to watch the Cool2Craft TV Channel right from your computer. Watch craft demos and join in the live chat at showtime at Cool2Craft.com. Monday October 22, 2012 – 9 am Pacific/11 am Central/noon Eastern. Believe it or not, the holiday season is right around the corner. It may see a little early to be thinking about Christmas crafts, but if you’re planning to knit or crochet this season, you need to start planning now. Certain patterns like tree skirts and afghans require some added time and effort and you don’t want to wait until the last minute! Luckily, the latest free eBook from FaveCrafts.com is available right now to download and save for years to come. 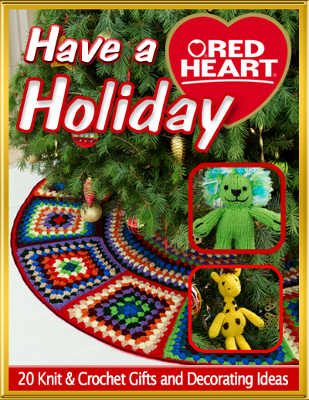 Have a Red Heart Holiday: 20 Knit & Crochet Gifts and Decorating Ideas features a variety of projects for yarn crafters at all skill levels. The book is broken down into two distinct sections: crochet patterns and knitting patterns. Within each section, you’ll find cute gift ideas and fun decor projects. Grab your yarn and dig up those hooks and needles – you’re sure to find some creative inspiration in the pages of this free eBook! Noel Knit Sweater Ornaments – Who doesn’t love a warm and cozy Christmas sweater during the holiday season? Translate your love for holiday wearables into an ornament you can hang year after year. This intermediate knitting pattern can be replicated over and over again using different yarn colors and weights. Work the ornaments up as you would a normal sweater – start with the body and add sleeves second. Holiday Spirits Bottle Bag – Don’t show up to a Christmas party empty handed. One great host or hostess gift is a bottle of wine and a handmade bottle bag that can be reused in the future. The festive design and pom poms make this a great holiday gift idea. Crochet the bag first and then create the tie and pom poms. Make a few and give them to neighbors, colleagues and more. Holiday Cat Collar – Get ready to say “Awww!” This crochet project is super simple but so adorable. Dress your favorite feline for the holiday season with this handcrafted collar. 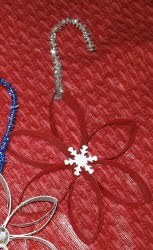 Create the collar first, add a poinsettia and finish by crafting the holly leaves. Everyone in your family should show off their holiday spirit – even pets! There are 17 other patterns in our latest free eBook, Have a Red Heart Holiday: 20 Knit & Crochet Gifts and Decorating Ideas and we can’t wait for you to check them out now! 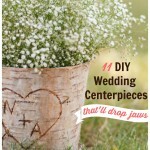 To download this eBook, simply head over to FaveCrafts.com. You can also find it in the Christmas crafts category on the site. Discover crochet gifts, knit ornaments and so much more – consider it an early Christmas present from your friends at FaveCrafts.com. When do you start crafting for Christmas? You’ll be singing “Joy to the World” when you see the new eBook from AllFreeHolidayCrafts.com. Homemade Christmas Ornaments: 9 Easy Ornament Tutorials is a collection of some of our favorite Christmas ornaments that you can make yourself. Between fabric ornaments, Santa ornaments, painted ornaments, and more, you’ll find the most adorable ornaments for your tree in this book of ideas and inspiration. The projects in the Homemade Christmas Ornaments eBook are gathered from some of your favorite craft bloggers who have designed these ornaments with instructions and materials lists so you can make them just as cute as they look in the photos. Each ornament tutorial includes step-by-step directions with full-color photos, so there’s no guesswork involved in making these ornaments. You can print out the entire eBook, or just selected projects, to keep by your side while you are crafting. While all of the projects in the Homemade Christmas Ornaments eBook are doable for any crafter, some of them are easy as pie. 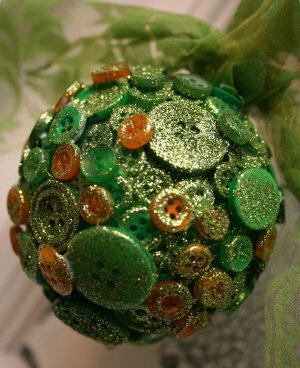 These are great ornaments to make if you don’t have a lot of time to spend on Christmas decorations. They are also good projects to do with your children. 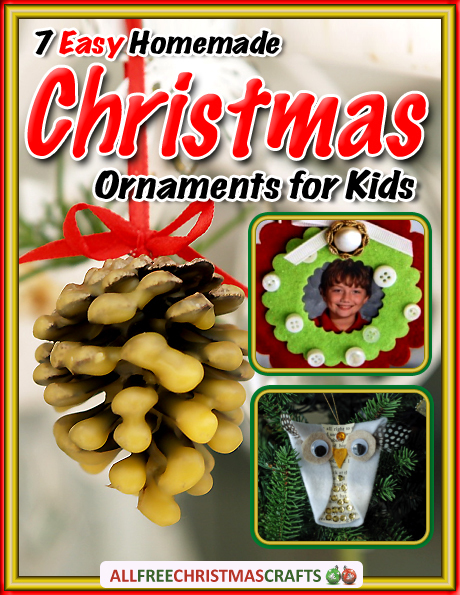 The kid’s Christmas ornament ideas in this eBook will get your children involved in crafting and decorating for the holidays. Making ornaments together is an especially lovely way to spend quality time with your kids during the Christmas season. 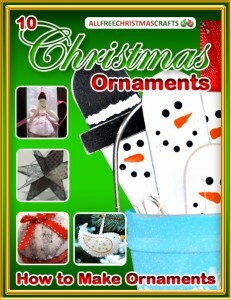 No matter your decorating style, you’ll find an idea in the Homemade Christmas Ornaments eBook to suit your tastes. 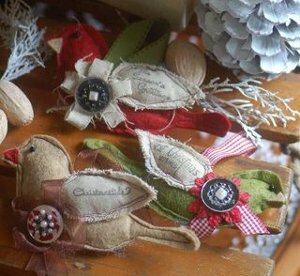 We have instructions for making rustic Santa Claus ornaments and country bird ornaments made from scraps of old fabric. We’ve got glittery ornaments for those of us who love a little sparkle, and sewing projects for crafters who can’t tear themselves away from the sewing machine. Make one of each of these ornaments to give your tree trimming some variety, or make a whole bunch of the same ornament to give away as gifts. Download Homemade Christmas Ornaments: 9 Easy Ornament Tutorials for free today, and start crafting for Christmas! What kind of homemade Christmas ornaments get hung on your tree every year? It’s been fall for exactly one week and I already miss summer. I don’t like the cold weather or the falling leaves. I don’t like warm drinks and heavy boots. I miss flip flops, pools and sunshine until eight o’clock at night. This is especially upsetting for me because I am the editor for AllFreeChristmasCrafts.com, a site that does not include any mention of summer at all. Okay, that’s not exactly true. 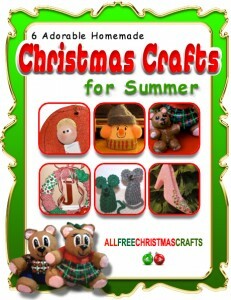 There is one mention of summer of AllFreeChristmasCrafts and it just happens to be one of my absolute favorite free eBooks, 6 Adorable Homemade Christmas Crafts for Summer. This eBook was created for people like me who can’t quite keep up with the seasons. It’s autumn now but I want to celebrate Christmas in July – is that too much to ask? No matter your state of mind, these projects will get you in the holiday spirit and spark your desire to get creative. 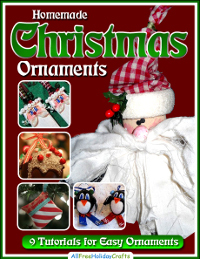 In this eBook you’ll find ornaments, wreaths and more. 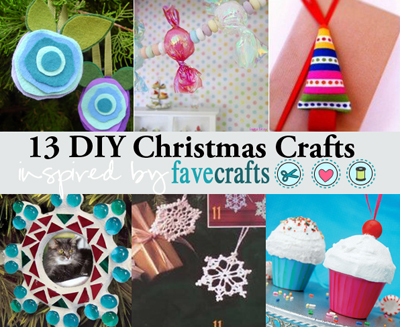 Make projects with the kids or crochet a present for your cat – there are so many fun options for Christmas crafting. 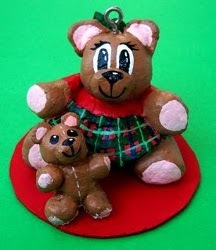 Dough Bear Ornaments: Create adorable teddy bear ornaments using a simple bread dough recipe. Once you’ve formed the bears and baked them for three hours in your oven, you can begin painting and bringing them to life. Cover the entire ornament in a clear glaze to help your ornament stand out on the tree. You can add a hook to the top and string it up on your tree or if you prefer, you can leave the hook off and place it on your mantel. This is a fun project for the entire family to work on together. Ruffled Fabric Christmas Wreath: If you love to sew, then you’ll love creating this DIY wreath. You can use festive fabric scraps for this project – the more mismatched, the better. 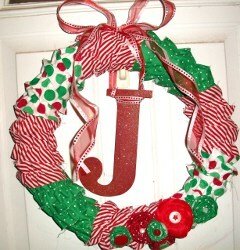 Spray paint a large letter and add it to your wreath for a personal touch. Make a wreath now and hang it on your door all season long. This is a great way to greet guests and show your holiday spirit. Download a copy of 6 Adorable Homemade Christmas Crafts for Summer – it’s free! Rustic, country-themed crafts are having a major moment right now. Many of these projects incorporate wood in some way and require materials such as twine and thread. What’s nice about rustic crafts is that you don’t have to live on a farm or even in the suburbs to create these projects. Even the most urban city slicker can find the supplies needed to create these down-home projects. There are so many ways to incorporate touches of the country into your own home decor. Now is the perfect time to capture the season and create your own Rustic Fall Vases. You can upcycle empty jars for this project and fill them with season flowers. Don’t forget to add a few decorative pieces to your wall as well. A cool gift for a down-home grandpa is the Rustic Cabin Plaque. Transfer a meaningful image onto a piece of wood – it’s a great alternative to giving a simple picture frame and it can be hung on a wall! Even the most urban space can be turned into a country escape with a Carved Wood Frame Plaque. Again, wood plays a huge roll in country crafts, and this project really captures that country feel. There’s something so refreshing about the simplicity of the lines and shapes of these decorative pieces. People travel to the country to get back to nature and clear their head, and each of these projects really captures that sense of calm. There’s nothing fancy or over the top about a wood box or a frame made from twigs and interestingly, that’s what makes them stand out. Rustic crafts also harken back to a simple time. These are the kinds of pieces you would have found in your grandparent’s country cabin, not in some modern home from 2012. 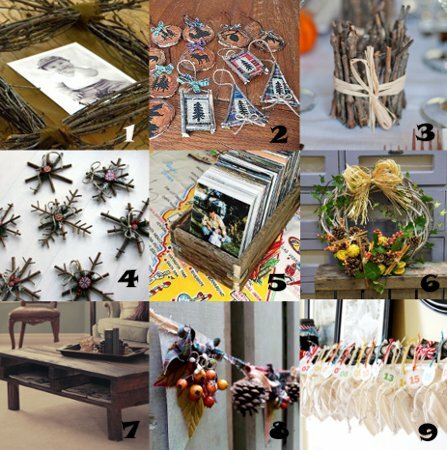 Do you like the rustic craft trend? Why or why not? Hey, cheapskates – this one’s for you! During the holiday season, it’s easy to feel like you’re overspending. From gifts to decorations, there are so many fun yet expensive ways to celebrate. Don’t get stressed out and forsake Christmas crafting to cut corners and save money this Christmas. Instead, make one of these inexpensive projects using recyclables and other easy-to-find materials. Use wine corks, felt, Christmas cards and more to create the projects featured in 7 Thrifty Christmas Craft Ideas. These simple projects won’t take long to make but they’ll last all season and you can even save some for next year. Hang a repurposed wreath or create cute labels for mason jars – the creative possibilities are endless! Enjoy the holiday season and stress less with this handy guide to all things thrifty. In this case, it’s okay to call yourself a penny pincher. In fact, with this free eBook, you’ll want to “go cheap” all year long! Christmas Card Saver: It’s hard to throw away Christmas cards at the end of the season, but for the sake of your space (and your sanity), it’s necessary to declutter when the season ends. 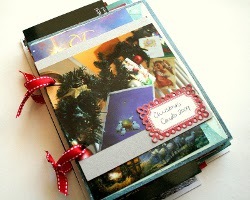 This year, save your Christmas cards and make a keepsake you’ll come back to year after year. Simply cut the cards in half and punch three holes on one side. Connect them with ribbon or binder rings and create your own chipboard cover. Make one every year – it’s a great way to preserve memories and save go green at the same time. Plus, you don’t need many materials for this project, so you can save big. 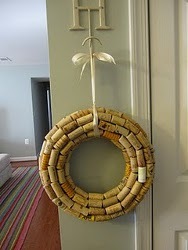 Wine Cork Wreath: Who doesn’t love winding down with a bottle of vino at the end of a stressful day? Save your corks throughout the year and use them for this super simple wreath craft. This project is so easy, even a beginner can make one. 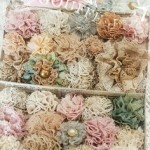 You simply need a Styrofoam wreath form, a hot glue gun and corks. You can make this project while you watch TV or listen to music, no need to concentrate hard or stress over the cost of expensive materials. Unwind and enjoy the creative process with this fun Christmas craft. 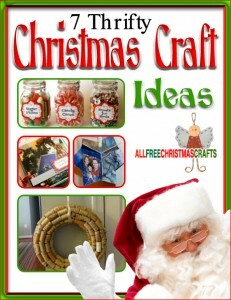 Download a copy of this 7 Thrifty Christmas Craft Ideas now – it’s free! Fall is in full swing, which means that Christmas is just around the corner. I’ve even spotted a few Christmas-related items at my local big box outlet stores. You might think it’s a little early to start planning the decor on your Christmas tree, but trust me when I tell you it really isn’t. In fact, the sooner you start planning, the less you’ll stress and worry once the holidays actually roll around. If you start working on Christmas crafts now, you’ll have plenty of time for family and friends in the weeks leading up to the holidays. How to Make Ornaments: 10 Christmas Ornaments to Make is the perfect resource if you’re looking for a fun afternoon activity that you can work on alone or with the kids. This eBook features projects for everyone in your family, no matter their skill level. Use beads, fabric scraps and more to construct these fun and crafty decor projects. You can even dig into your recycle bin and use cardboard tubes to create a Christmas star. Music Sphere Ornament: Pardon the pun but this ornament really hits a high note! Save decorative paper or napkins and use Mod Podge to cover a circular Styrofoam ornament. An inspirational word strip and glitter will make this ornament really shine and stand out on your tree. Cardboard Star Ornament: This eco-friendly ornament is a great project for the whole family. Have kids practice their cutting skills by cutting up toilet paper rolls and paper towel rolls into smaller strips. Glue the stripes together and spray paint the finish piece. Add a pipe cleaner to the top and have it dangle from your Christmas tree. Kids will love showing off their finished creation. Download a copy of this eBook today – it’s totally free!